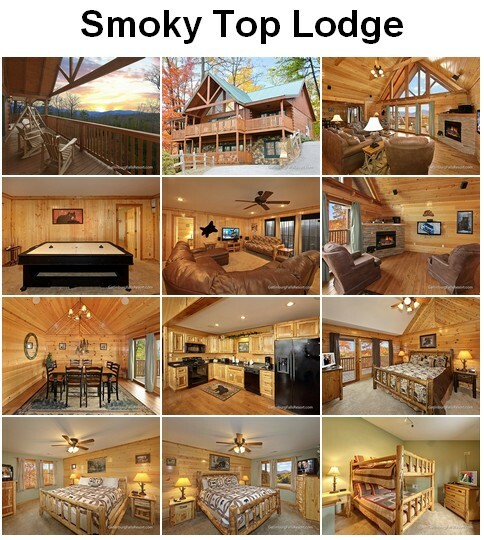 Smoky Top Lodge is a 4-bedroom Smoky Mountains luxury rental cabin that satisfies the eternal quest to find the very best view combined with maximum privacy, a gorgeous vacation cabin tucked away in its own private nook. A 4-bedroom cabin with 5 full bathrooms, Smoky Top Lodge is built on a spacious scale with vaulted ceilings and high glass windows, and packed with amenities for living and playing that together offer comfortable sleep and vacation time for up to 15 people. In its own little corner of the world with breathtaking views, Smoky Top Lodge also affords ample parking, making it easy for people to share. It’s amazing how extra people sharing a luxury cabin can bring the individual cost down to peanuts, and make those snap get-togethers a reality. Smoky Top Lodge is just five minutes from downtown Gatlinburg, with Pigeon Forge a little further down the road, and all the joyous bustle of these two towns ready and waiting for those who wish to venture out to play. 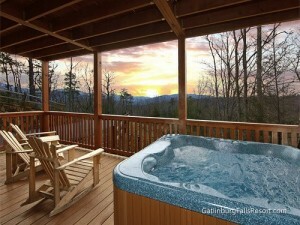 But then there’s the hot tub on the deck, one of two deck levels, or the porch swing, and the Smoky Mountains all around, a feast for the eyes and soothing to the ears. It’s called relaxing, and Smoky Top is made for it. Inside there’s a fireplace to hunker down by, and the game room to shoot some pool before dinner perhaps, or play some games, maybe followed by a movie on the big screen in the home theater, or the large flat screen in the expansive living room. Close to hand is access to a heated community swimming pool, as well as our own conference center and wedding facility (and Gatlinburg IS the third most popular place in the world to get married). Sometimes we wonder if we can take a few days and squeeze in another trip to the Smoky Mountains, get away with friends or family and find a luxury cabin to hang out in, maybe get some work done, maybe just live. Smoky Top Lodge has the answer. Click here to check availability and book Smoky Top Lodge for your next trip!